I am a strong believer that almost any trend can be interpreted in your style no matter what your age. There are some tweaks that need to happen to make something more age-appropriate, but it can always be done. This season the leather moto jacket is everywhere. This is a piece that every woman should own, and in my opinion, is timeless. Here, I’ve taken the same jacket and showed it at three different ages. In your 20s you can take more risks and wear a cute sequined mini to show off your legs and pair it with some killer booties. The 30s for me are really a mix; keep your cuts more flattering but take risks with color, texture and pattern like this sparkly polka dot tee. In your 40s it’s all about classic shapes and pieces that flatter you. Choose colors that complement your skin tone and pop against your basics; this wool pencil skirt is the perfect example of that. Choose patterns in a smaller print that are still fun and unexpected. No matter what age you are, the biggest key to dressing on trend is confidence. 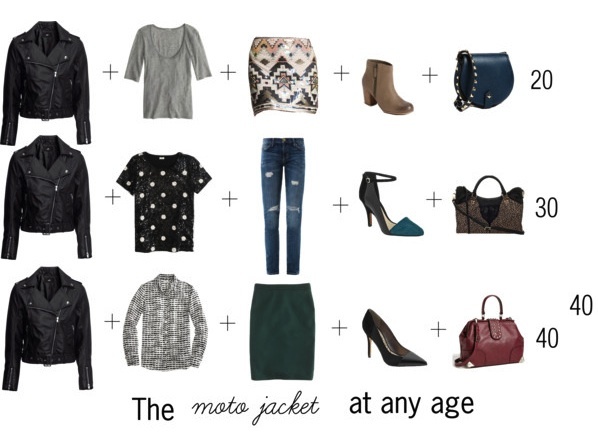 Now, go pick up a moto jacket and make it your own.